As one of the world’s biggest Fast and Furious fans not named Bill Simmons or Adam Carolla, I’ve treated the upcoming release of 7 the way normal people might treat, say, the birth of their first child. Somehow, the creators of this series have taken a combination of drag racing, lovably archetypal characters who really believe in family, otherworldly special effects, and dialogue that skirts the line between ‘enjoyably pulpy’ and ‘damn, they’re awfully pithy for common criminals, huh?’ and alchemized that mixture into something glorious. Since our long national nightmare is over and the release of 7 is finally upon us, let’s commemorate this occasion the only way we know how—with a ranking of all previous Fast movies up to this point. Ride or die. Fast 6 poster, image courtesy Wikipedia. It’s often said that you can’t get everybody to agree on anything. You couldn’t get 100% of any survey to say that the sky is blue or that vaccines are a good idea. But if there’s one issue that should be able to unite this country, it’s the ranking of Tokyo Drift as this series’ low point. I don’t know anybody who places this movie any higher, and I don’t want to; it’d be like meeting someone who never showered, or believed he was born on Mars. I wouldn’t even know where to start. Ergo, the friggin’ quarterback from Friday Night Lights is the star of this bizarre endeavor, and there’s even a miserable cameo from one of the kids from Home Improvement, if you’d like your childhood ruined. In this desultory, poorly-acted flick, our high school protagonist gets sent to Japan to live with his strict father and get his life on track, or something. Instead, he discovers the underground world of drifting—i.e., oversteering your car to skid through a corner with some flair. It’s even less exciting than it sounds; the big bad racing technique around which the whole story is based is…cars slipping through turns at moderate speeds. Get excited! So little about Fast3 makes any sense or delivers any fun or coolness—we could really do without all the adults telling the kid to be more responsible—and its impotence, combined with Walker’s and Diesel’s exclusion, should allow us to force its secession from the Furious Union. (Even the IMDB trivia section gets in a swing on the piñata, offering thinly-veiled shade disguised as seemingly neutral observation: “Although [love interests] Sean and Neela are meant to have feelings for each other, they show very few signs of affection.” Yeahhhh.) The only FF movie I haven’t seen more than once. Points lost for the confusing laziness of the title—sorry, you can’t just drop the “the” out of your first movie and claim it as a fresh moniker—and for Walker’s new buzz cut, which is microcosmic of a slightly more generic ‘stoic tough dude’ role than his rollicking, blonde-locks-flowing, surfer persona of yore. We want P-Dub in full-on California-pretty-boy mode, dammit. Yet, while 4 was the last Fast movie to not feel like an event, it holds up better than you remember. It’s the darkest movie of the series, visually (and maybe thematically too, as it contains Letty’s apparent death), and its night-time car chase through L.A. might be the best street race in the whole series. This is the sequel that the series never had, reuniting Brian for the first time with Dom and Mia. Our two heroes both end up infiltrating a drug cartel led by a mysterious Mr. Braga, and 4 has less fluffy padding than, say, #2. It doesn’t have many dead spots, and it does feature some excellent detective work from Mr. Diesel. Who else could look at a road where a crash occurred and deduce what garage worked on the car involved? Although Braga’s secrecy is nicely handled, 4 still could have benefited from a stronger villain, but FF have never been particularly strong at crafting their baddies. I’m not sure driving through those tunnels in the climax is the most effective set-piece, but what really matters is that the most important relationship of the series is back in action. Brian and Dom are together again, although there’s still tension—the latter wins the centerpiece race after sketchily bumping homeboy’s car off course just before the finish line. There could be no stronger sign in the world that the man harbors some lingering resentment than that. That’s some advanced level character work right there. After the titanic Fast Five that blew everything else out of the water, 2013’s Fast and Furious 6 settles back down into a nice groove. It doesn’t try to outdo 5 at its own game; not only is 6 leaner and shorter, it’s also considerably more easygoing. The absence of conflict with The Rock dulls some of the edge, for better or worse, and nearly all of the intra-group interactions now reside in that ‘lovable teasing’ range. Whereas every moment in 5 felt charged with explosive stakes, 6 is more relaxed; even Walker’s foray into a U.S. jail, ostensibly a dangerous mission, never seems to really concern anyone. This type of mindset has its advantages. Some of the lighthearted lines between the group members sizzle, and now that the gang is firmly established (including The Rock, natch), we can happily cheer for them together (more on this dynamic later). The film picks up steam after a somewhat clunky first half-hour—the gang has to un-retire to track down a group of expert criminals that includes Letty, Dom’s presumed-dead former squeeze—culminating in breathtaking sequences involving a tank and an airplane runway. But 6 isn’t without its flaws. We could have done without Ludacris and Rock having to dress down a car salesman who treats them like peasants—not only would nobody dare talk to someone the size of Dwayne in such a condescending fashion, but the poor sap’s punishment wasn’t even all that satisfying. Furthermore, the film fails, once again, at providing a worthy villain. Not only does Owen Shaw blend into the background and not even earn himself a memorable death on that runway, but he commits the dumbest error in the entire series by keeping Letty around even after learning that she used to reside in the arms of one tank top-wearing baldie. Also, it must be said: for as many times as the characters emphasize the strength of their bonds, they’re awfully blasé about Gisele’s selfless, dare-I-say-heroic death during the runway sequence. I mean, this is the girl who helped Vin get to Braga in #4, and who Han fell in love with—as we’ve all done—after seeing the sketchy Fast Five villain caressing her bikini-clad derriere. She deserves a better sendoff than ‘Oh, she died? Huh…well, we’re free now, thanks Rock!’ Demerits all around. But that climax, no matter how many jokes about the length of the runway it spawned, was a visceral thrill, and the exciting tank sequence probably features the series’ defining image. 6 is essentially neck-and-neck with the film above it on this list, and it confirmed that the the Furious films had become A Thing. But while its smooth charm makes it eminently watchable, it falls short of the peaks of its predecessor. Every FF fan, I believe, has one movie in the series that he/she truly can’t explain. (If you only love Five, you’re not a true fan, is what I’m saying. Not that there’s anything wrong with that.) The second, best-titled one—bless you, everyone on Twitter who made the ‘2 Kill 2 Mockingbird’ joke in response to the news of Harper Lee’s impending second book—is that one for me. I love this movie, but I can barely articulate why. All I know is that with its exotic Miami locations, bevy of hot cars racing for little reason other than to race (something that’s unfortunately happening less and less), and the idea of Paul Walker and Eva Mendes propagating the species, it’s gotta be the sexiest movie of the series. It oozes Miami. Yes, casting one of the friends from Good Will Hunting as the villain (who was forced into one of those awful ‘let’s show how nasty he is by having him sic a spider on someone’ scenes) could have torpedoed it. And 2 Fast has its share of scenes that, while not terrible, are fluffy and vacant; the Mendes stuff starts up and then goes nowhere, we see Ludacris orchestrating speedboat races in Miami for some reason, and there’s a good chunk of time when nothing of consequence happens. But Tyrese’s random energy, Paul’s iridescent smile while driving backwards on the highway, the Thomas Crown Affair-inspired ending, and the killer street race at the outset overcome all that. All I really need is to see Walker hitting the NOS and shouting for joy as he soars over a competitor’s car in the air. Everything else is just elaborate window dressing. All I really need is to see Walker hitting the NOS and shouting for joy as he soars over a competitor’s car in the air. Everything else is just elaborate window dressing. I’m not the first person to make this point, but 5 truly feels like a demarcation point for the series. The film, which broke the box office and revitalized the series, changed the vibe more than any other. By the end of this one, I think everyone was in on the joke (even Vin, who probably took a while to come around.) And the non-linear jump in the magnitude and explosiveness of the stunts and special effects guaranteed that each film now has to go balls-to-the-wall to top the last one. Need proof that the series had abandoned its roots? There’s a moment here when Vin and Paul crash a street race to win a couple cars…and we don’t even see the race! What?! Two and a half hours, and you skip the race and just cut to our heroes triumphantly driving their trophies home? Oh, no, no, no. Similarly, a few of our boys later obtain cop cars—via another off-screen pilfering—in a manner that feels overly casual and convenient even for this franchise. 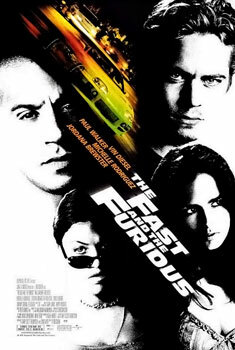 In place of these racing scenes, 5 adds a heist storyline, about 35 new team members, The Rock (probably to make Vin feel self-conscious about his biceps), and a tiny bit of fluff; the latter includes a few of the early scenes at the group’s safehouse and most of the eye-rolling sluggishness surrounding the loyalties of that brainless, bearded friend who never liked Walker back in the original movie. Most of all, Five validates the psychological phenomenon that the beginning and end of anything resonate more strongly in our minds than the middle. When you finish this, you won’t think about the somewhat inconsistent midsection. You’ll love that it stings right from the jump—from the takeover of the hilariously un-secured prison bus transporting Vin (a maneuver that, naturally, produced “no fatalities.” one of the funniest lines in the series) to that train heist that culminates in our heroes driving off a cliff and falling to their deaths gently into a lake hundreds of feet below. (FF does its best work when making the fearless drivers tangle with bigger and badder methods of transportation—jumping onto boats, pulling down airplanes, running alongside trains, etc).And you’ll definitely still be buzzing about the climax, which features Brian and Dom hauling—in two separate cars—an enormous safe full of cash through Rio de Janeiro. Action movies—all movies, really—stick in your mind when they’re fresh and original. I’ve seen a lot of fights and chases and heists before, but I’ve never seen a safe the size of a studio apartment get dragged through a metropolitan city by two cars fleeing from cops. It’s overwhelming. And it takes the whole movie with it. The Fast and the Furious poster, image courtesy Wikipedia. Damn, The Fast and the Furious came out a long time ago. Its story, derived from a magazine article for which the author did not negotiate nearly enough compensation, may have ripped off Point Break, but damn if it didn’t have style. But that style was countered by an undercurrent of darkness; it’s able to demonstrate how these characters are on the path towards self-destruction without morally condemning them for it. More grounded, simple, and intimate than the newest incarnations of the series, the first remains my favorite by a safe margin. Our knowledge of Walker being an undercover cop who’s working an angle on Vinnie D’s crew keeps us entertained while we wait for their inevitable confrontation. (Yes, kids, you can use writing techniques like dramatic irony in popcorn flicks.) Their dynamic defined this movie and then the rest of the series, even after their contentious start gave way to respect and then admiration. I think the series’ popularity has its roots in this aspect. People like watching characters who care about other people. We get invested in characters who care about others, even when those characters are criminals. And Fast nailing this dynamic is one reason it surpasses and outlasts movies like, say, Gone in 60 Seconds, wherein the love interests seemed like they didn’t want to hug each other. That’s why it matters that Walker seems to genuinely like Jordana Brewster for reasons that go beyond her chassis, why the series got better when the grumpy buzzkills went away, why it’s OK that the characters in FF 6 mention ‘family’ about as many times as I’ve watched the 7 trailer. All the unintentional comedy, outlandish jokes, and mind-blowing effects work because there’s a base of solid support underneath. Vin, for all his flaws, looks like he belongs near cars (something that could not be said for Nic Cage in Gone), and Walker’s casting fit perfectly alongside Diesel’s wrong-side-of-the-tracks tough guy. Of course, I can’t end this post without noting how much I’m going to miss Brian O’Conner in subsequent installments. Hearing about Walker’s death in the fall of 2013 legitimately ruined my night, and I honored him the only way I knew how—by plopping the DVD of this movie, which holds up smashingly well today, into my TV. The only force counterbalancing my excitement for Furious 7 is the inevitable sadness that will come when I realize that Walker is done showing up on screen.